Let’s face it – life can be pretty busy at times. Many of us have full-time jobs, families to take care of and homes to keep clean, among lots of other things. So we aren’t surprised to hear that many of our customers have little or no time for exercise. The New You Plan is not just about losing weight but changing attitudes and lifestyles. And because of this, we are fully onboard with introducing exercise into our lives. If the thought of trying to fit a workout into your already hectic lifestyle has you breaking out in a sweat, panic not! 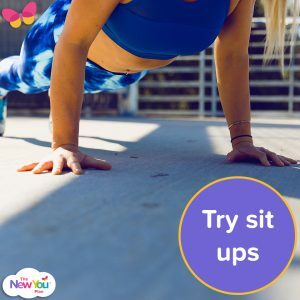 Here we share our 5 top tips to easily add exercise to your lifestyle! 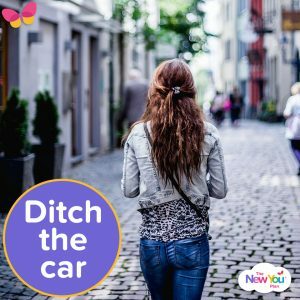 If and when you can, ditch the car and walk instead. If your commute to work is within walking distance (and you find yourself sitting in traffic anyway), why not make a commitment to walk to work a few days a week? Start off with one or two days a week to begin with and gradually add in an extra day. 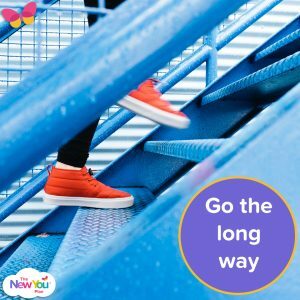 Knowing that you’ll arrive at work, having already easily added some exercise into your daily routine will keep you feeling great for the rest of the day. Or, if you simply can’t walk to work, make it your mission to use your feet more. Get up and walk around the office (when you can), carry out those errands by foot, or go for a quick power walk on your lunch break. If your job involves planning and strategising, try getting out of the office with a colleague and doing it on foot. You’d be surprised what a change of scenery and breath of fresh air can do for both your mood and thought process. This is definitely one of easiest ways to add exercise to your lifestyle without even noticing it. Ditch the lift and take the stairs instead. Choose a parking spot a little further away from your destination and get a little extra walking in. If you take the bus or train to work, get off one stop early and walk the extra distance. It might take a little extra time but it’s a sure way to add in some extra steps and you’ll feel great about it. If you’re an early bird, use the morning to your advantage. Before you jump in the shower, try to do some sit ups. Start small and build up how many you do over time. It will only take 5 minutes each morning and starting the day with a little exercise means you are more likely to stick to healthy eating for the rest of the day. Plus, you’ll be super toned! 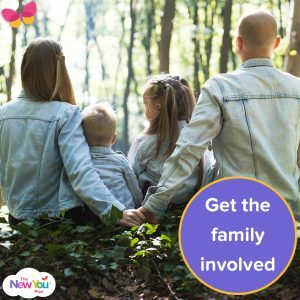 Whether it’s finding a class that you all love, or throwing a frisbee in the park on a Saturday afternoon, getting the entire family involved is a fun way to get active, without even noticing it. Not only will you be burning calories, but you’ll also be spending quality time with your loved ones, which is a win-win! Fit-Bits are the latest craze in technology and we can’t say we’re surprised. 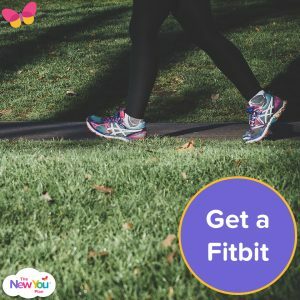 These are worn around the wrist and measure the number of steps you do each day, with the aim of reaching 10,000 steps per day goal. This adds up to about five miles each day for most people, which includes about 30 minutes of daily exercise—satisfying the Center for Disease Control’s (CDC) recommendation of at least 150 minutes of moderate exercise per week. You’d be surprised by how motivating these can be. Last year we regularly gave away FitBits as prizes to our customers and the difference they made to their lives was astonishing. Just seeing how many steps were walked each day was the perfect motivation to not only meet the 10,000 steps target but exceed it. So there you have it! You can easily add exercise to your lifestyle without even having to think about it. Say hello to your New You!